I know what you’re thinking: a white blazer?! But it’s 10000º outside! However, when it’s the right summer blazer, this is a look you can absolutely pull off at work or for fun even during the hottest days. 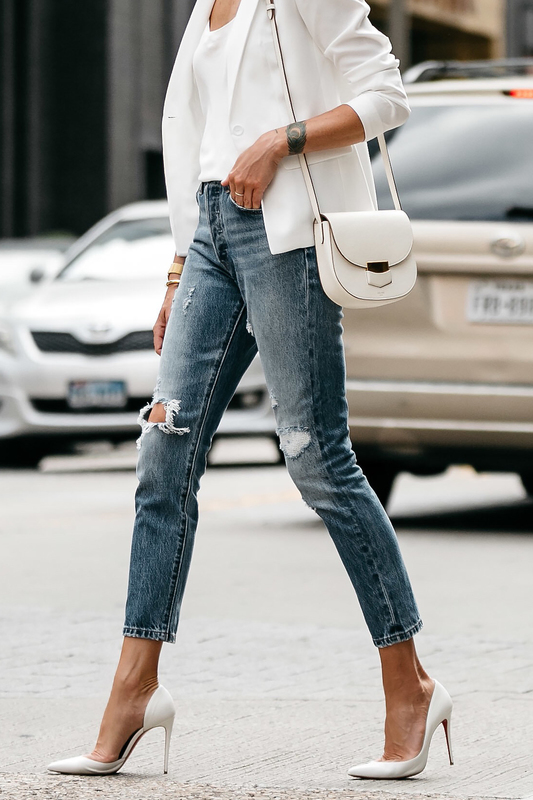 Paired with the perfect, simple cami and great pair of destructed denim, a structured white blazer like the one I’m wearing creates an impossibly chic summertime look. Keep this look in mind next time you’re tired of wearing work-appropriate dresses during your 9-5, and opt for something like this instead. This is an effortless outfit you’ll want to keep on repeat. Classy and cool combo at the same time! This outfit is AMAZING. Could you tell us what size you are wearing, so we have a reference point for sizing? Thanks!